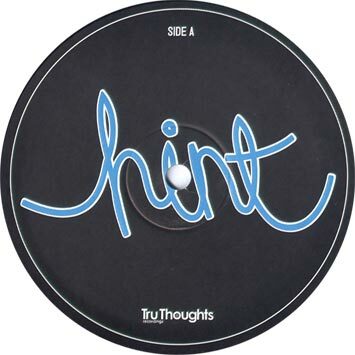 Hint continues his dance floor mission for Tru Thoughts!!! Not only are there tunes for the dance floor, this 12" includes tracks that will undoubtedly please fans of his classic down tempo projects, as found on his debut long player "Portakabin Fever" (Ninja Tune). 'Keep Your Shirt On' features vocalist Laura Vane, fresh from working on songs for The Streets' upcoming album and performing with The Streets live. She is also a vocalist for Part Time Heroes. Definitely future soul music. 'I, Silverfish' takes a leftfield hip-hop direction. Fusing influences from Dub Step with a different twist and featuring master lyricist Rup on vocal duties. Don't forget to check Rup's album 'Rup On Zebra' on Zebra Traffic records if you like the style. The AA side is aimed straight for the discothèques. 'At The Dance' has without doubt one of the biggest bass lines of the year. The Tru Thoughts DJ's have been playing this to huge effect with lots of enquiries - the secret battle weapon is now out! 'Snake Patrol'keeps the clubbers happy and provides a great guitar hook for air guitar fans! This is a limited vinyl release and will also be available digitally via the key digital stores. 'At The Dance', as Hint describes it, is 'English, quirky and lean...' a collection of individual tracks, with each one fighting the others to be someone's favourite. These five superb tracks cross over a number of musical styles from electro to modern soul to hip hop and were all recorded in a wooden shack in the West Sussex countryside. Hint (ex Ninja Tune/Hombre artist) has played on the main stage at The Big Chill, and is eminently recognisable from his track 'Quite Spectacular', which featured on the high profile Britvic J2O advert. Hint is currently planning an up-tempo hip-hop project with MCs, including Josie Stingray from Oakland and Crunch from London. The A side of the EP kicks of with a stunning vocal track 'Keep Your Shirt On' featuring catchy, belting, modern soul vocals from Laura Vane who is currently recording with The Streets. She has previously worked with MJ Cole, Gnarls Barkley (on the last ever Top Of The Pops) and Part Time Heroes. Track two 'I Silverfish' features verbals from South London wordsmith Rup from Tru Thoughts' sister label Zebra Traffic. This track has a unique laidback hip-hop edge. 'Mutes & Drops' the last track on the A side is a beautiful electro, downtempo track reminiscent of Hint's previous album 'Portakabin Fever'. The B-side moves into a more dancefloor orientated groove with the huge bassline of 'At The Dance' and 'Snake Patrol' already getting support from Jazzanova.